- Silk Infusion 12 fl. oz. - Keratin Mist 12 fl. oz. 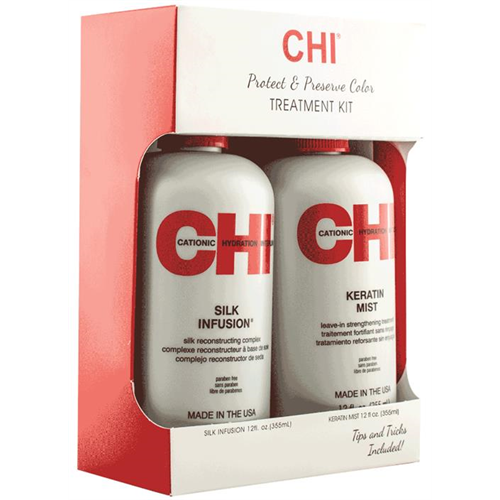 Silk Infusion: A rich leave-in treatment, enriched with silk, wheat, and soy proteins that will penetrate and help strengthen hair, while providing incredible softness, manageability and shine without build up. Keratin Mist: Specifically developed to work in conjunction with the CHI line. Keratin Mist is an advanced leave-in spray to provide hair with strength, protection and softness while leaving hair silky and shiny with incredible manageability.